We just moved into a new house, and I love how after a little fresh paint, it's kind of a blank canvas. We've collected a lot of wall art in my daughter's previous room, but I'm ready to make a change to her room decor instead of trying to make it all work here in a new place. 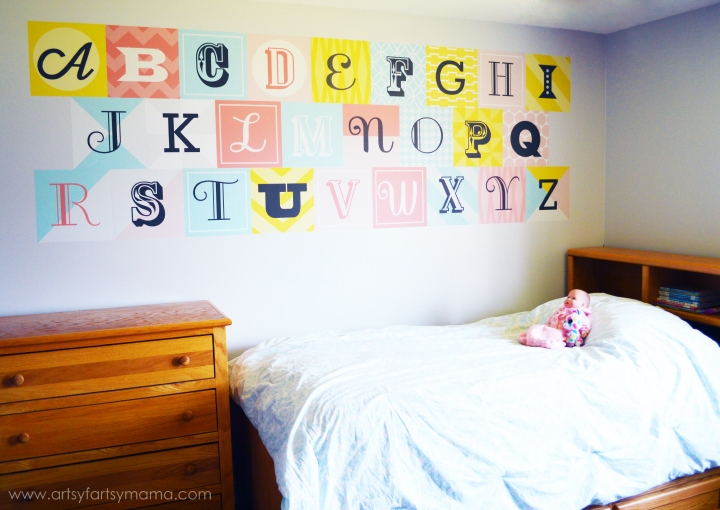 As soon as I saw these Colorful Woodblock Alphabet WallPrints Fabric Decals from Wallternatives, I knew they would be the perfect place to start on getting my daughter's new room to feel more like home!! I love the colors, and the different patterns and fonts. Plus, it's the alphabet!! 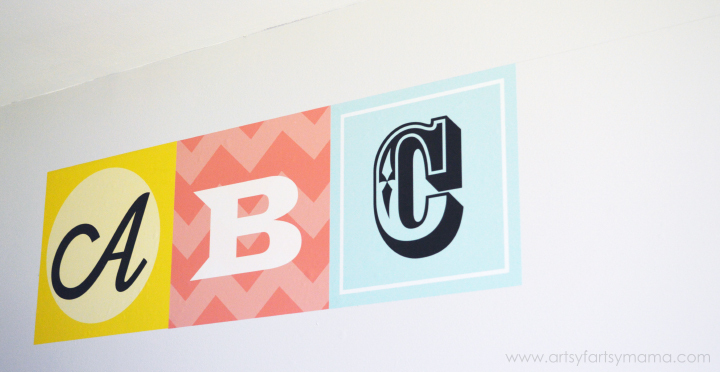 So fun for any kids bedroom or playroom decor!! This set comes in three sizes (we used the large size), and also comes in blue for the boys! Wallternatives are an affordable, and easy way to add wall decor to your home without a lot of effort. These particular decals are called WallPrints Fabric Decals, and are made of premium polyester fabric instead of a paper or vinyl. The adhesive on fabric decals is repositionable, removable, and reusable. Yes, I just said reusable!! 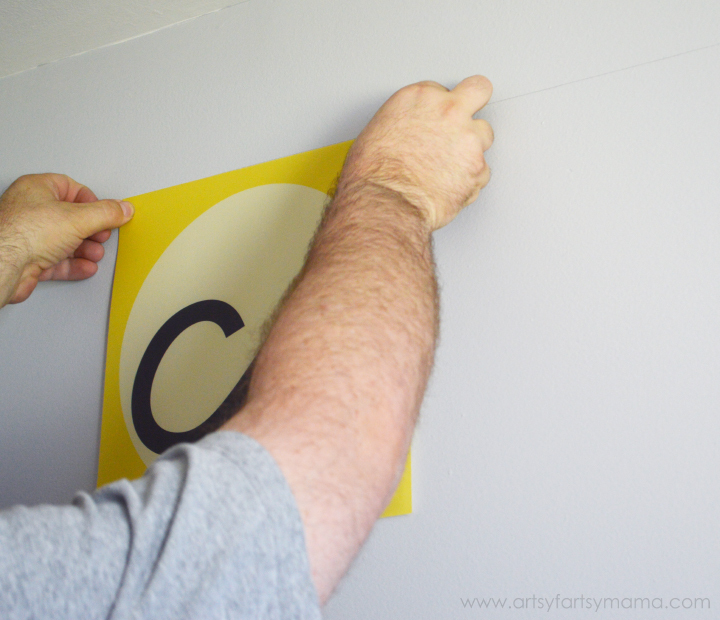 The decals arrived rolled up, so we laid them out on the floor to flatten before applying them to the wall. I was pleasantly surprised hat it took almost no time at all before they were ready to go! First, we made a plan on how to lay out the design. The great thing about most of the Wallternative designs is that there is no rule on how they have to be placed. YOU decide on how to arrange the design! Each square was about 12", so it was pretty easy to do the math. Using a tape measurer, a level, a pencil, and a really long box as a ruler, we marked a line where the tops of the decals needed to be placed. It's the most frustrating thing to work hard hanging up some wall art to find that it's completely crooked when you're done. So, measure two (or three) times, make sure the line is level, and then make sure again. Peel the first square off the backing, and line the top left corner up on your marks. If you accidentally stick it on crooked, you can peel it off and reposition it and it sticks just as great as it did the first time. Smooth out any bubbles with your hand, or peel and re-stick if necessary. If you accidentally fold the decal on itself, don't panic! You can pull it apart without a problem and without having to cry in the corner. It will stick on perfectly. Since it is a fabric material, it doesn't peel, rip, or even show wrinkles or folds! 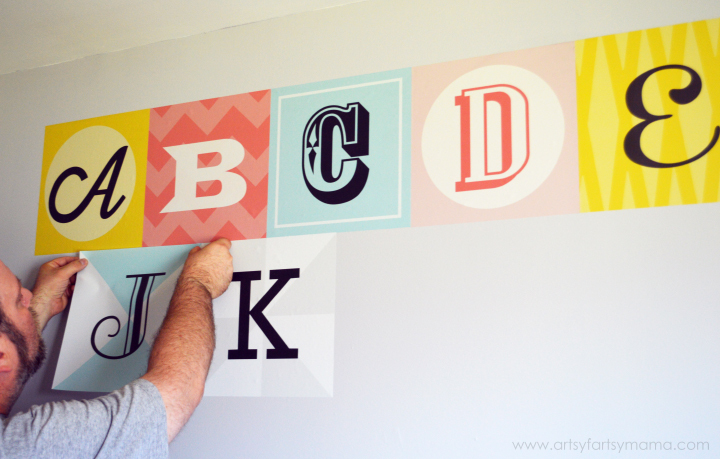 Line up the next letter decals using the top line and the previous decal as a guide. As long as you marked your lines right, they should go on without any worry of them being crooked. I wanted the next row to be staggered, so once the top line is done, center the next decal between the first and second squares. Luckily, the "K" design had a center already marked, so we used that one first to get the placement started. Keep using the other decals as your guide, and it should be no problem at all and seems to go pretty quick. Place the last line of decals, and make sure they're all stuck on smoothly. Once they're all in place, you're done!! Stand back and admire your work. 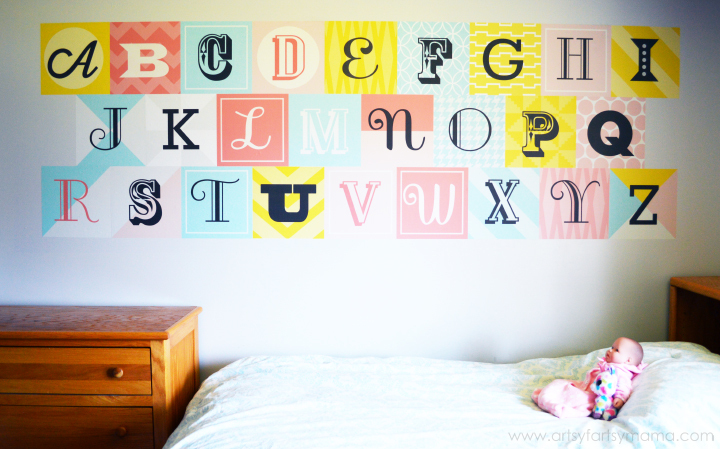 I absolutely love these Colorful Woodblock Alphabet WallPrints Fabric Decals, and am so excited to finish decorating my daughter's room! I received the decals from Wallternatives in exchange for this post, but all opinions are my own. That is super cute and so fun!! This is awesome! I think I need one for Connor's playroom. Oh my goodness! This is just lovely! I love these, Lindsay! 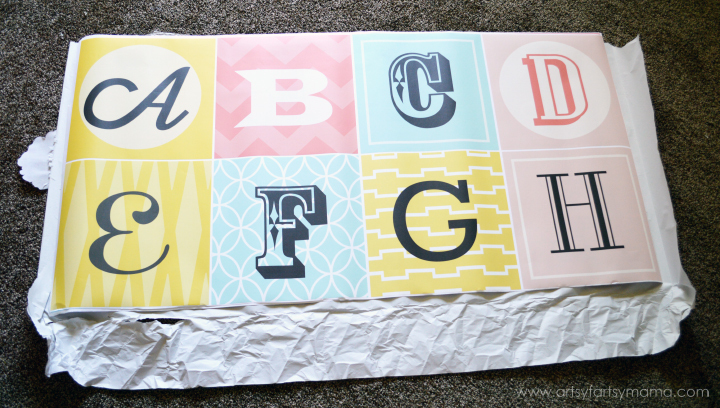 I'm thinking of all of the great ways I could use these to decorate my girls' new rooms! Checking this site out ASAP! These stickers are really beautiful. I like the color harmony. I think it's a good idea for children's bedrooms. Thank you.